The cross upon which Jesus was crucified has long been called the True Cross. Supposedly rediscovered by Saint Helena in 326 CE, fragments of the cross are now purportedly scattered around the world, where they are revered as holy relics. Fortean Picture Library. The True Cross is the cross upon which Jesus Christ was crucified around 30 CE. For many reasons, the artifact disappeared from discussions within the Christian Church over the next centuries. During this time Christians operated as an underground movement and periodically experienced severe persecution. Their status changed radically early in the fourth century, when the Emperor Constantine assumed the throne of the Roman Empire. Constantine, over a period of several decades, first decriminalized and then legitimized Christianity within the empire. Constantine’s mother, Helena (c. 248-c. 329), became a devout and enthusiastic Christian, and with the support of her son founded a number of churches and assisted in the process of Christianity becoming a public religion. Following the visit of Macarius, the bishop of Jerusalem to Constantinople in 326, and his lamentations over the neglect of the Christian holy sites located there, she journeyed to Jerusalem and personally surveyed the locations described in the Gospels. Macarius assisted her in finding the exact locations mentioned in the four biblical books about Jesus’ life and ministry. Among the places she visited was a rocky outcropping that was pointed out to her as the place where Jesus was crucified. This site was outside the ancient city but close to one of its gates. Nearby was a cave identified as the place where Jesus’ body was placed and from which he was resurrected. The Roman Emperor Hadrian (r. 117–138) had a large earthen foundation erected there that covered both sites. Upon this foundation a temple to Venus was constructed. Helena’s visit, however, followed Constantine’s conversion of the empire to Christianity, and the temple to Venus had been dismantled by the time she arrived. Helena began excavations of the rubble of the former pagan temple site. According to the stories that circulated several generations later, she discovered three crosses. 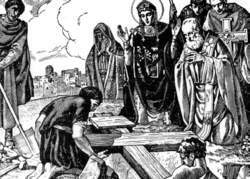 They looked very much alike and gave no indication as to which might be the True Cross, though the board that Pilate had placed on Jesus’ cross, the titulus, was also found. The means of distinguishing Jesus’ cross from the other two was provided by a dying woman who resided nearby. The three crosses were taken to her, and she was asked to touch each one. When she touched the True Cross, she was immediately healed. The earliest account of the discovery of the crosses and the healing of the unnamed lady is recorded in the historical work of Rufinus (c. 345–410), which was written some seventy years later. Constantine would later see to the building of the Church of the Holy Sepulcher on this site. Through the fifth century, variations on Rufinus’s account of Helena’s discovery emerged. They offered very different details about the finding of the cross. For example, Sozomen (c. 375-c. 447) suggested that Helena found the cross as a result of some dreams she had. He also said that the Roma Sybil (prophetess) had predicted the finding of the cross. By the end of the fourth century, a number of writers mention the cross and suggest that the wood had been divided and distributed to churches and church leaders in a variety of locations. Cyril of Jerusalem (c. 315–c. 386) suggested that relics of the wood from the cross could be found throughout the whole inhabited earth (i.e., around the Mediterranean Basin). There are also a variety of documents from this period that were accompanied by gifts of pieces of the cross; usually, these were letters from one prominent church leader to another. The main part of the cross left in Jerusalem seems to have survived until the time Saladin defeated Christian forces at the Battle of Hattin in 1187. Soon afterward Saladin took the True Cross away and it has not been seen since. The belief that the True Cross had been found and was in the hands of the Church would affect the Church’s liturgy. The Church of the Holy Sepulcher was dedicated in September 335, and by the seventh century a feast of the Exaltation of the Cross was being celebrated as far east as Rome on September 14 in memory of that event. About the same time, a similar feast that recalled the date of Helena’s founding of the True Cross was celebrated in various places on May 3. Both days were later added to the calendar of the western church, though the May 3 celebration was dropped in 1970. In his attack on the use of relics, Protestant reformer John Calvin (1509–1564) remarked, “There is no abbey so poor as not to have a specimen. In some places there are large fragments, as at the Holy Chapel in Paris, at Poictiers, and at Rome, where a good-sized crucifix is said tohave been made of it. In brief, if all the pieces that could be found were collected together, they would make a big ship-load. Yet the Gospel testifies that a single man was able to carry it.” This is an exaggeration, to say the least, but the quote does carry the emotional reaction to an overemphasis on relics in many parts of the Catholic Church in the sixteenth century. The Protestant aversion to relics in general would be superseded by the historical and scientific attack upon the authenticity of those objects held by the Church as genuine relics. That attack has highlighted the gaps in the records of all of the relics that are believed to relate directly to Jesus and events in the Gospels. In the face of the attacks on the True Cross relics, in 1870 French Catholic scholar Rohault de Fleury published a study of all the known relics that supposedly included part of the True Cross. He concluded that, if brought together, they would contain considerably less wood than would have been in the cross used to crucify Jesus. Pieces of the True Cross can be seen at many locations around the world. The majority of these can be traced to a piece that appeared during the era of the crusades, when so many relics were brought back from Jerusalem. The largest single piece appears to be located at Santo Toribio de Liébana in Spain. Heiligenkreuz, a Cistercian abbeyin Austria, claims to house the second largest collection of fragments of the True Cross. There are at least four pieces of the True Cross in the United States. They are located at Saint Helena Catholic Church, the Bronx, New York; Holy Angels Catholic Church, Mt. Airy, North Carolina; Cathedral of the Holy Cross, Boston, Massachusetts; and the Shrine of the North American Martyrs, Auriesville, New York City. The titumus is on display at the Church of Santa Croce in Jerusalem. Borgehammar, Stephen. How the Holy Cross Was Found: From Event to Medieval Legend. Stockholm: Almqvist & Wiksell, 1991. Pohlsander, Hans A. Helena: Empress and Saint. Chicago: Ares Publishers, 1995. Thiede, Carsten Peter, and Matthew d’Ancona. The Quest for the True Cross. New York: Palgrave, 2002. We had already seen a large piece of the true cross in a church in the Azores, but no nails. She had come with her mother to the Sainte Chapelle to hear Mademoiselle Coupain play the organ and witness the extraordinary spectacle of the convulsionnaires, brought thither to be touched by the relic of the True Cross. Perhaps John used a piece of the true cross for a tooth-pick. In the chapel of this college there is some wood of the true cross set in silver. This cantle of wood is from the true cross, this other from Noah his ark, and the third is from the door-post of the temple of the wise King Solomon. The true cross of the Redeemer was the sin and sorrow of this world-- that was what lay heavy on his heart--and that is the cross we shall share with him, that is the cup we must drink of with him, if we would have any part in that Divine Love which is one with his sorrow. He said that the inclusion of new members like Pakistan has greatly strengthened SCO which has emerged as a true cross regional and cross continental organization playing a multifaceted role in the world politics. The compendium consists of homilies on the Cross' significance to the faithful and on the story of how Saint Helen found the true cross. It contains small precious fragments from the Instruments of the Passion of Our Lord: from the True Cross, Nail, Thorn, Column of Flagellation, Reed, Purple Cloak, Seamless Robe. Celebrating the Santa Cruz De Mayo, according to Laya, started just in the neighborhood, where young boys and girls reenact the finding of the true cross where Jesus Christ was crucified by parading around the neighborhood.